Reader at�Rug Rag made us aware of this talk by Barry O'Connell at the Textile Museum, Washington DC, on Caucasian rugs. 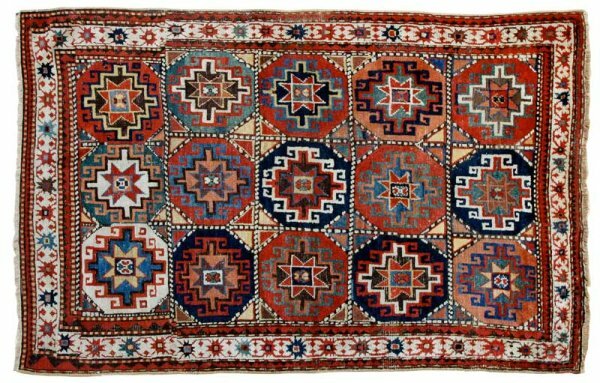 We like old Caucasian rugs.�The videos are�an education, but more about the history of the Causasus region�than about the rugs. The intro here, and the rest of the series is on our continuation page below. Fascinating! (I'm glad I keep a World Atlas near my computer!) I began the series for the rugs, but am also a history and geography buff, so this was a very enjoyable & informative group of postings. Washington's Textile Museum is one of those delightful 'secret places' that are open to inquiring souls [who are pretty much broke and need intellectual stimulation]. I lived in Washington D.C. for two years back in 1969-71 and it was a favorite place of mine, along with Dumbarton Oaks gardens in Georgetown, very near the Public Library. Those gardens are a lovely place -- terraced down the side of a ravine, across from the Old Naval Observatory. which is now the residence of the Vice President. Harvard owns Dumbarton Oaks and , at least during that period, used it as their Center for Byzantine Studies. Appropriate, no? I love the rugs because it allows me to better understand the people. Hopefully the folks at www.RugRag.com will post the show and tell portion of the talk. A wonderful custom is that collectors bring in related pieces for discussion. You can see amazing treasures on a Saturday morning.